We've just brought home a 4 1/2 month old puppy from an assured breeder (on Friday). She was crawling with fleas and her ears stink, theyre full of brown stuff - which I've tried to clean out. I bathed her 3 times to get out the dirt and used advantage plus to kill the fleas and all the eggs - of which there were loads. btw she's not anywhere near housetrained either. What have I done, this poor little might is so adorable but . . . I don't seem to have much luck with kennel club assured breeders - what am I doing wrong? Autumn, that is awful for you and the poor pups. What do you want to do? I am no expert in this but here are some thoughts. You can seek a re-imbursement for any vet bills, medications that you should not have had to give on day one of getting the pup - ideally that would be after getting a written supporting document from your vet. You can complain officially to the Kennel Club and via other channels like social media if the breeder is on facebook etc. You do need to double check all the vacs docs and any health/eye check docs to ensure they are valid. Such a sad post, makes me really angry at these people who only care about the money and do not care about the dogs. If you are keeping her I really hope she turns into a very special pet for you as her start doesn't sound the best. I didn't respond to your other question "what am I doing wrong"
Can you explain exactly how you found this "breeder" and everything you did to assure yourself that you were getting a good quality pup. I think it would be helpful for others to read and also we can give personal experience on what if anything we did or would do differently so that you never go through this again. Following on from Julie's questions (please do answer them) how come you have just brought home a 4.5 month old (18 weeks or so) old puppy? Normally when going through the KC assured breeder list, you would be vetted by the breeder, you would ask your questions, then assuming you are both happy and there are puppies available you would get to see the puppies around 6 weeks old, make your choice, then collect them at 8 weeks old. So what's the 'go' with your 18 week old girl? Did you not notice anything amiss when you collected her? I agree with Julie that I also could not return her to the breeder (it's not her fault she has not been so well looked after) but I would also be contacting the breeder in the first instance to get an explanation. What's her name and can we see a picture of her? Thanks for the replies. I searched through the kennel club find a puppy - I also contacted the schnauzer club, who sent a list of breeders - this breeder is on both, a kennel club 'assured' breeder of excellence, with stud dogs, over 5 litters etc, and a groomer apparently! I have since contacted her. Lola was kept back as a possibility for showing/breeding apparently, hence her age - she told me she brought the dogs in at night time but there were big dog pens/runs outside and now I realise that this pup at least, was kept outside. The breeder apologised and said she uses ear tar on her dogs, whatever that is, she just cleans the inside the ear flap and a little way in with kitchen roll - she said to take her back and she will clean her ears and give me some. I didn't mention all the fleas because I've realised that this was going nowhere as a resolution and I don't want to take her back. The breeder can't cope and was saying that she's thinking about packing it all in! So I'm just going to have to get these ear mites or whatever it is sorted and be very patient with our new big baby Lola - I say baby, she's a hefty 6.4kg and seems so big. Lola hasn't played with pippin yet, she wants lots of fuss from me and follows me everywhere, she does follow pippin too but won't play, hopefully as she settles in more, she'll get more confidence. I will keep updating. Wow what a stunner Lola is - a real heartbreaker I do have a soft spot for the black colouring (having a black mini myself). Well at least you have spoken to the breeder - it sounds like, as you said, Lola was kept back for the breeder who has since had second thoughts. The good thing is that Lola is at home with you, being kept in a safe, warm and loving environment and has a playmate in Pippin. Really nice pictures. I'm sure Lola and Pippin will bond, it takes a few days for the dust to settle and for them to sort out who's who but it does work out. If you bought Lola from a KC Assured breeder then as a condition of that sale you should have received a questionnaire to complete and return to the KC. In that you will have an opportunity to report back anything good or bad and there are questions specifically about the condition of the pup. If however you didn't receive that then the breeder isn't following the guidelines for the KCA scheme and you should report them to the KC, as they should not be on the assured breeder scheme. What happens, as I'm sure you're aware is that the breeder will hold back a dog they think will be good for showing (or breeding) and if it then becomes out of standard then they will sell it on. You say Lola is big - perhaps this is why she was sold? You say that she's nowhere near housetrained. The KC Assured breeder scheme does not insist on the dog being raised indoors and if she was an outdoor dog then she will have had little to no training in this area. While it wasn't the ideal start and certainly not what you'd have hoped for, you've got yourself a beautiful girl who will make a lovely addition to your family and with consistent effort from you, you'll be rewarded with a lovely companion for you and Pippin. Thanks for giving us a little more detail. Lola is a stunning pup, sounds like you have found the answers as to why she was in this condition. A breeder who is not coping and as a consequence therefore not giving proper attention to her dogs. She is with you now and is very lucky to be able to leave that kennel environment. Hopefully these minor problems will be solved quickly and you can look forward to watching this lovely pup settle in. Do take the vet for a proper check up and check those docs for evidence that vacs etc. and parent checks etc. have been properly carried out. 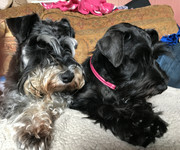 Just one thought, I might consider writing to someone from the schnauzer club, in confidence, that you think a breeder might be struggling to cope and could use some help from the club. In my mind I think I would have done everything I can to try and help any future new owners and the breeder of course. Just a thought. Lola looks really lovely and I am sure in time she will bond just fine with Pippin. As regards breeders, no matter whether they are on the Assured Breeder list or not, and whether you are looking for a puppy or an older dog, it is vital to fully research and not rely on a certificate or length of breeding/ showing/ grooming or anything really other than your considered opinion and instincts having met the breeder and seen their dogs and how they raise their puppies. If you are looking for a home raised puppy then do not get one from a breeder who has their dogs in kennels, however pristine, as you cannot be sure that the pups are reared in the home. Spend time with the breeder, at their home, talking about the dogs, listening to their experiences etc. I would expect a minimum of several hours social contact with a breeder, at their home, as well as any online contact, and to feel completely confident in their protocol for raising pups, their attitudes to health testing etc and just how they interact and behave with their dogs. Parasites and dirt on a puppy or dog would be an immediate warning that things were not right as well as the statement that the dogs only came into the house at night. Hi and thank you for your replies. Everything makes sense in hindsight regarding kennels etc although she told me that all the dogs came in at night but only since, has she told she brought Lola in a couple of days before I was to pick her up, so she could get used to being in the house. Yes I've been silly but I don't regret getting her - she's so lovely and is now playing with Pippin and starting clicker training. We haven't had a successful walk yet as she's petrified of the traffic. We shall persevere. Lola's ears are improving each day, with a lot less smell now - I've been doing a thorough clean with Clean-otic. She's had 2 baths since being with us and is now so nice to cuddle. The fleas and eggs are completely gone, she's been combed within an inch of her life - those little pests are not welcome. The breeder rang me today and was very apologetic and said she doesn't understand how she could have missed it, she says she feels bad and will send me some ear tar. Maybe I'm too soft or too stupid but I can't bring myself to report my concerns. I feel bad for mentioning it at all. Hi Autumn, you are neither, I wouldn't dwell on it then and just enjoy your new pup. I agree with what Julie says Autumn, you are just a concerned owner and now don't want to make a fuss.